I really want a small pillar drill that is available for use on a regular basis. I have a Unimat 3 lathe/mill, but whenever I want to use it as a drill it is normally configured wrong and so lots of messing around. At this point I normally resort to the much larger milling machine and this is just not delicate enough for 2mm drills. So for some time I have been looking at the Universal Pillar Drill that you can buy as a set of plans and castings. Then I thought why not buy another Unimat 3 post and drill attachment and make it into a permanent drill. The Emco Unimat 3 lathe and system is brilliant and I already have many different parts – so why not build on this as a technology base? Very few marks on the post or the head. Also, no play in the bearings – note that the bearings in the head are plain and it is a god idea to oil them on a regular basis as they can get hot and will develop both radial and end play. This head and post was in a really good condition and so a stunningly good buy for the price. There is a separate fine feed that can be fitted to this head if you want to use it as a milling machine. For this particular use I don′t think I need it. The first task is to build a nice sturdy base. My idea was to build the base from a wood sandwich. Home made captive nuts tapped 6mm to tack the caphead bolts that fix the bottom end of the pillar. As you can see here I applied slow setting 2-part epoxy to the nuts. This shows the nuts from the other side before I pulled them through and slightly proud. The nuts are in one of the oak layers. The layers of oak and mahogany all glued together to form a substantial base. This is looking rather rough at this point and quite a lot of machining was needed to get this into a better shape so that I could then mark out a nice plan form. 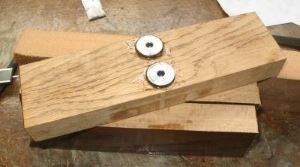 The captive nuts that were shown earlier you can now see are slightly proud of the wood in which they sit. A Wooden Base!? – The fact that I’m bolting the pillar into a wooden base that will compress and move feels wrong, but you need to remember that this is just a base that allows the pillar drill to sit on the workbench and remain upright. 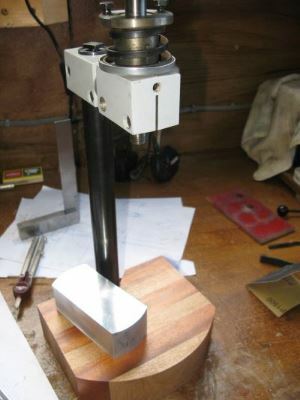 The table that the workpiece sits on when being drilled is fixed to the column independently of this base and so maintains the angle and position relative to that – in this case this block is mad from aluminium and has a clamping action on the pillar. The “V” shape is a nice form to pull the pillar into. This was a bit hit and miss, but the wood is soft compared to the steel pillar and so you can adjust the bolts to pull the pillar into position. I use an engineers square bakanced on the wooden base and tighten each of the bolts in turn to get the most upright pillar I can. As stated earlier this is not that important to the working of the pillar drill, but it just makes it look nice. The sandwich of wood at this stage looks rather rough and ready, all glued together with TiteBond and left under held with clamps for a number of hours. I next drew a line on the top surface centred on the captive nuts and at right angle to the back face. This then allowed me to mark out a width for the base and to add a curved front edge. I cut out the shape using my Record Power BS250 bandsaw and sanded the surfaces using my homemade disc sander. The TiteBond glue sands really easily and does not go to a stringy mess if you leave too much on the surface of the wood. Again, the varnish penetrates the wood and glue seamlessly. As this is a sandwich of different wood, it is important to let the varnish dry naturally and once completely dry to then sand back with a fine sandpaper to key the surface before applying a second coat. In the past I have tried t accelerate the drying of the varnish by placing the wood in a warm environment and have found that one of the types of wood used has shrunk more than the other leaving a wavy finish. After sanding the base I then gave it 2 coats of plyurethane varnish. The pillar attaches perfectly and forms a nice looking stable and solid base. 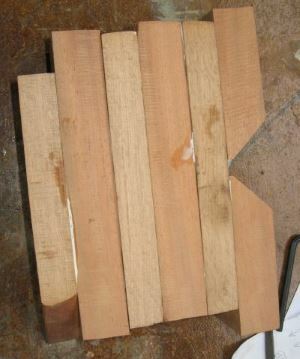 The next step is to form the part to support the table. 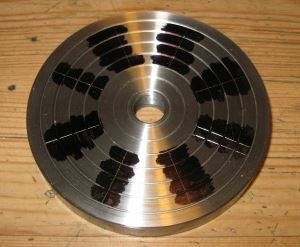 For this I found a piece of aluminium that had been cut from a round. Later you will see that I got to wondering whether the base was rather think and that I could machine a slot into it so that I could add a drawer in which to store chuck keys and allen keys. I machined this table from a 1/2″ thick slice of mild steel. I quite often mark out using a permanent marker to colour the metal plate, wait for it to dry and then scribe. This is much cleaner than engineers blue and you get a very nice regular surface to scribe. 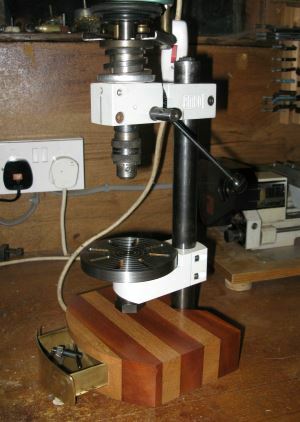 The centre of the table was threaded 14x1mm – the headstock/tailstock/drill head thread of the Unimat 3. 8 slots were machined in the table 6mm wide so that parts or vices can be bolted down if required. 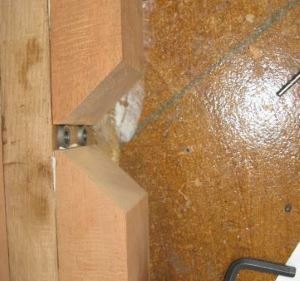 After some machining the table was threaded onto the support spigot and slotted into the bracket. As this image shows the table is quite large for the size of the drill, makes for an easy surface to work on. Whilst machining the arbor (thread cutting with the Hobbymat MD65) for the plate I thought it would be worth engineering an indexing system that would allow me to effortlessly, but accurately drill the fixing holes for cylinder end covers etc. I used the Hobbymat lathe with the Unimat milling head to index and make the holes 6, 8 and 10 in three rows that would allow me index combinations of: 2, 3, 4, 5, 6, 8, 10. The 14x1mm thread allows me to fit Unimat chucks etc to the mill and so easily hold parts for indexing – this is just a practise part that I drilled 6 evenly spaced holes in. The piano wire for the indexing is ok, but is a bit flexible and not that elegant. I will replace this some time soon when I think of something better, maybe just another piece of piano wire with a neater bend. Now with the aluminium table support powder coated in white the drill is really starting to come together. The wooden base was rather thick and so made me wonder about including a drawer. After some machining out the core and then folding a drawer out of brass it is a nifty addition. 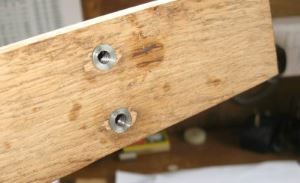 The table support shaft and nut were treated with a blacking chemical. The finished drill with rubber pads under the base and a black front to the drawer. I looked online for chemical blacking for brass, but did not really want to wait for it to arrive and so just tried the Birchwood Gun Blue that I had bought for the steel components and if applied generously and left then it works rather well. You do need to clean the parts very well before you apply this bluing chemical and I used Asaka Cleaner. The only thing that could be better is the drive motor. I saw a more powerful sewing machine motor (120W) on ebay with a white case and it rotates in the direction that will allow it to be mounted pointing upwards and so lead to a more compact design. It would be nice to also make a neat belt cover – something for the future as this is now functional and there are engines to build…. I’ve finally made some nice pulleys from aluminium for the motor and the main shaft. 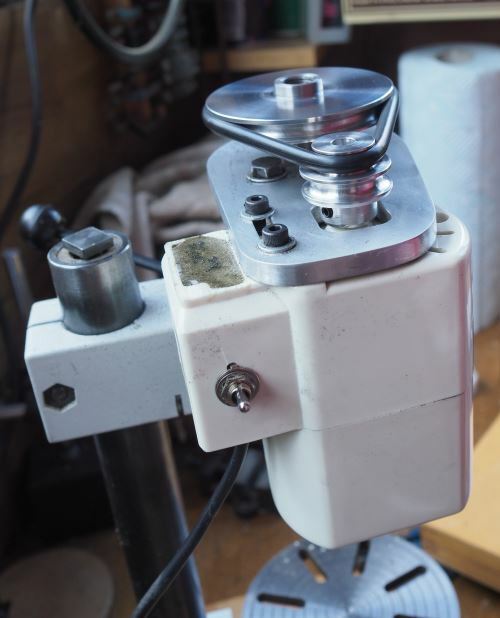 The main shaft pulley is a single stage and the motor is two stage, the basic reasoning is that I can move the motor pulley along the shaft and align it when I need a change of speed. 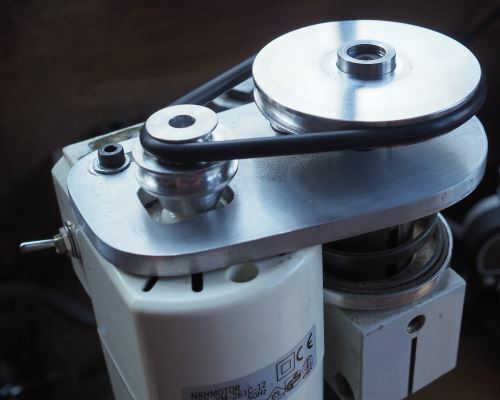 The aluminium pulley on the motor is much better than the original plastic pulley as I’ve machine it to a more accurate profile to accept the circular rubber belt and the result is it grips the belt much tighter. 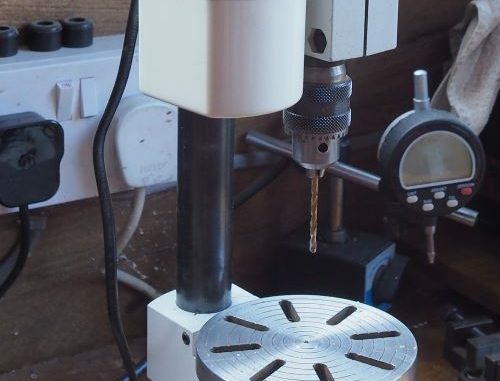 This has been a great project and has resulted in a neat small pillar drill that is just perfect for sensitive drilling with drill bits from 0.5mm to 6mm. 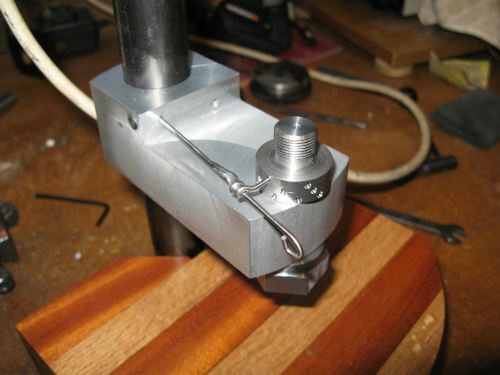 The indexing arrangement and 14x1mm thread attachment gives great flexibility. I think total cost once I buy a new motor will be just under £200. Update: the table was never quite right as the table was just not aligned precisely and so I filled the hole in the aluminium bracket with Durafix and then machined it in place on the pillar drill itself. 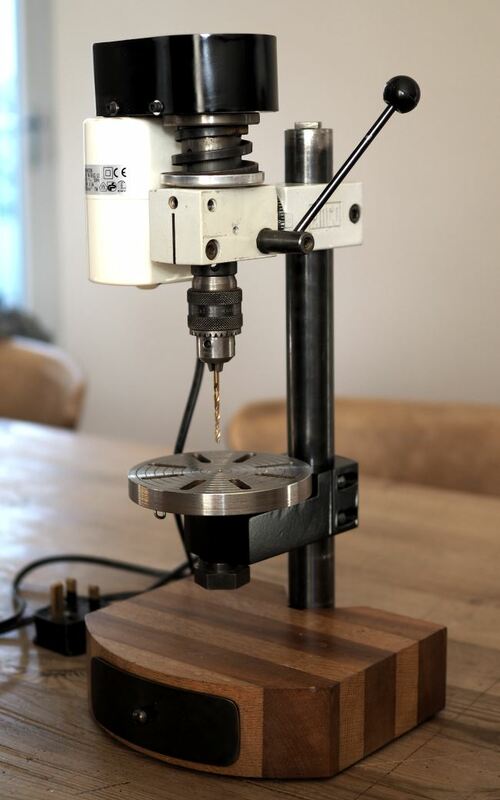 The final precise drill is now shown here with a black bracket support the table. NICE!!!! 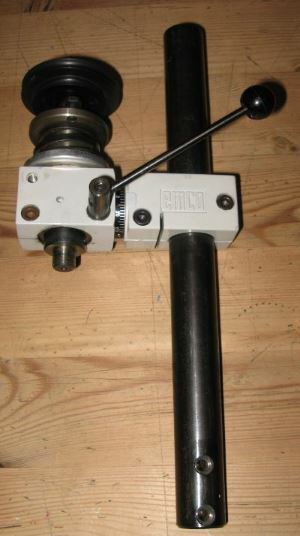 I want to take a DB200 Unimat, Headstock drill post and do something similiar to my SL1000 Unimat Lathe, to make a sort-of Unimat 3 that will have the Mill/Drill BOLT directly to the bench behind the machine! -To form a Machine “center” of sorts, just like that of the Unimat 3, for hobby use and be equally versatile to be able to use most Unimat SL1000 & DB200 parts! -NICE work!! !